Just a heads up, as MVM announced today on their Facebook page that they have acquired two new titles for UK release. They say that they have never been released in this country before, and all being well, they should make their UK debuts in April and May. Just what titles they are will be revealed in the New Year, so make your wish lists and stay tuned. You may have noticed that the UK's sole online anime streaming source has been offline for the last three days. That's because they are now transitioning away from ANN's servers to servers of their own, and with that change will come a site redesign. All things being equal, the new site will go live later today. Existing users will get an e-mail with a new temporary password for the site. This is the most obvious non-news of the week, given Manga Entertainment's continuing lack of breakthrough in the Blu-ray market. Their first long running title attempted on Blu-ray, Fullmetal Alchemist: Brotherhood only got as far as the second volume before being cancelled. Manga still held out hope that some way of releasing the series as a complete Blu-ray boxset could be found. Recently they tweeted that they just couldn't find that way, so henceforth, Brotherhood will only exist in its UK entirety on DVD. Incidentally that DVD complete series boxset is pencilled in for August 2012. It's been another slow period for new titles being released, although there are plenty of re-releases and complete series collections to be had about now. In terms of reviews though, I've had to make it another rollover week, and delve into my collection for some un-reviewed titles. It meant that I finally have had the chance to broach that Blu-ray backlog of mine, and with it Ghost in the Shell 2: Innocence. That's Mamoru Oshii's follow up to the original Ghost in the Shell movie, as opposed to anything in the subsequent Stand Alone Complex universe. Back when I watched it on DVD, Innocence was a visual tour-de-force, another step forward in expanding the scope of what anime could accomplish. Watching it on Blu-ray ought to have been a special delight, but the intervening years have made the story stand out a little more in comparison to the visuals. See if that's a good thing by clicking the link. Finally, it really was a blast from the past, as having seen 5 Centimeters Per Second, I was sufficiently motivated to at last seek out some of Makoto Shinkai's other works. 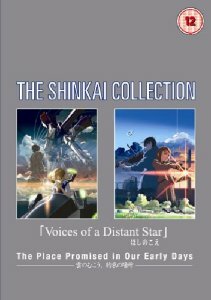 The Shinkai Collection gathers two of his other films, The Place Promised In Our Early Days, and Voices of a Distant Star into one convenient collection, along with a nice production booklet. When it comes to anime, Shinkai has been described as the next Miyazaki, but he's far from that. He's actually one of the few auteurs in the industry, and he creates animated works of pure art and emotion. With his Children Who Chase Lost Voices From Deep Below due in 2012, it was an opportune time to catch up with his filmography. 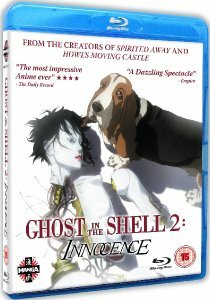 Manga Entertainment released Ghost in The Shell 2: Innocence on Blu-ray a few years ago now. 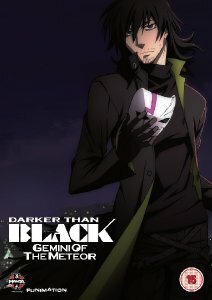 Darker Than Black: Gemini of the Meteor is their last release for 2011, and comes out on Boxing Day. The Shinkai Collection was released back in 2007 by ADV, and is very deleted at this point. You'll have to be a bloodhound to sniff out a copy, but it's worth it.